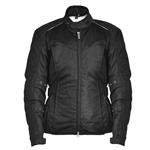 Ladies textile jackets are great for riding in mild weather. 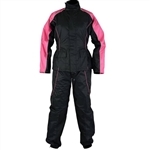 Many styles are equipped with removable liners & plenty of vents to keep you comfortable & cute in many different weather conditions. 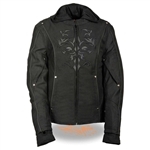 Textile jackets are a great alternative to leather motorcycle jackets and offer many of the same features. 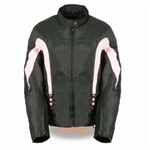 Our textile riding jackets are made from quality nylon or textile materials that are durable and will hold up to the many weather conditions you many encounter. 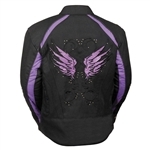 Our ladies riding jacket come with cute feminine details and fun embroidered graphics like butterflies and tribal designs. 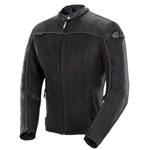 Leather Bound offers ladies textile riding jackets from popular brands such as, First Classics, Joe Rocket, Field Sheer & Milwaukee Performance Apparel. 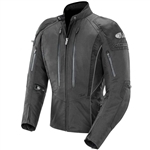 Your sure to find a great deal on the motorcycle brands you love and trust when you order online from Leather Bound.